After the class has gone over the shot compositions, decide which people will be included in your portrait montage (can be classmates or other students in the school). You need 7-9 people in your video. You must storyboard your shots before shooting to make sure the people alternate who is on left and who is on right each time when you edit. Record 30 seconds of each person even tho you may only end up using 10-15 seconds of the shot in post. Using the on-board camera of a mobile device, record each person for the video (be creative with the background areas), import the files to your computer, edit together in Adobe Premiere, add a school appropriate music track that fits your target audience (audio should fade in/out) add titles to balance the spacing. Titles must include name (larger font), hobbies and hometown (smaller font) for each person. Must have an ending title with your personal information. The final edited video should be around two minutes. After you have finished your project, save it as the last name + first initial + vidport. Export the media with the same name (ex: pettyvidport.MP4). Submit the exported video to the teacher. 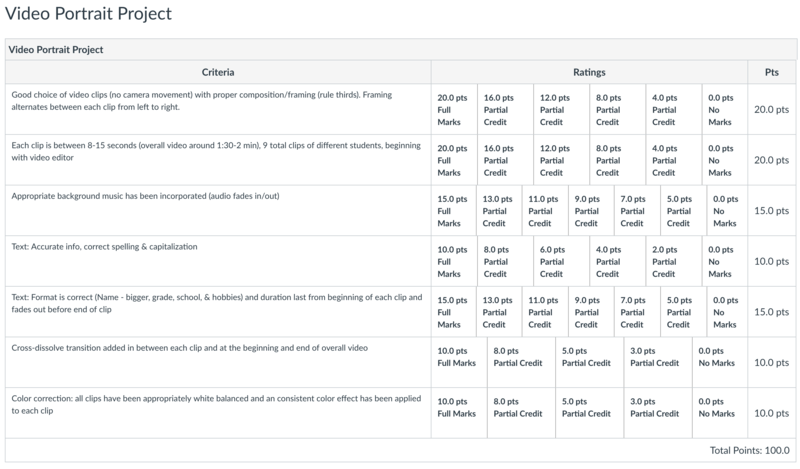 Don't forget to review the rubric to make sure you are meeting all of the project requirements.